London is a shopper’s paradise; there is nowhere else in the world with so much choice and such iconic stores. Sometimes, though, it is hard to get around our great city especially if you are carrying around goodies from some retail therapy. Rather than struggle on the tube or get lost on the streets, let Ye Olde England Tours offer you a door to door service from your hotel to some of the biggest names and must-see locations on the tourist route. 1. Debenhams – It’s a big name across the whole of the U.K. and the flagship store in London has just been treated to a fantastic £25m makeover! However, it still stocks affordable ranges from a number of British designers, including Jasper Conran and H! by Henry Holland. Covering seven-floors, Debenhams has something for all including a gorgeous beauty hall, a stylish menswear floor and, of course, a very hip homeware department! 2. Fortnum & Mason is the official grocer to The Queen and the beautiful store also has four restaurants and sells the most indulgent foodstuffs. If you want specialist teas or exquisite hampers, this is the place to go. Fortnum & Mason really is the quintessential English store and has been selling food, luggage, homewares and clothes to London’s finest since 1707. 3. 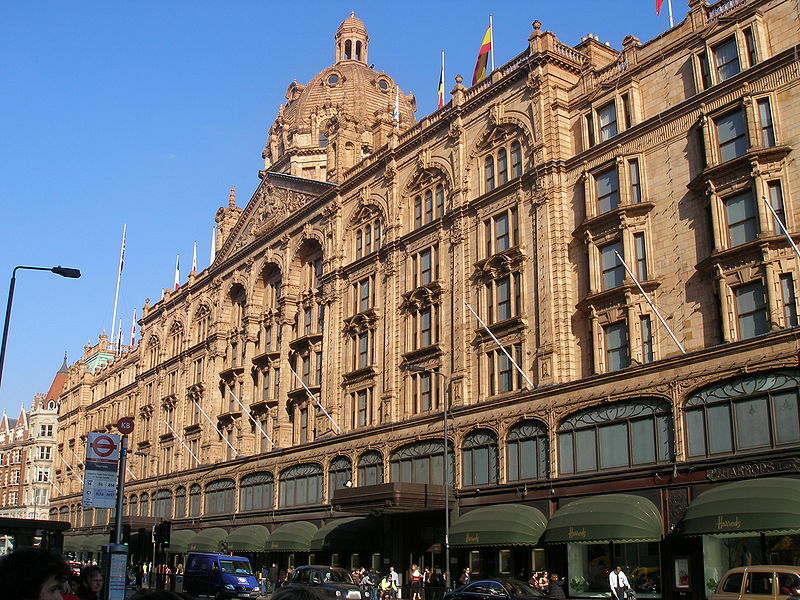 Harrods – Established in 1849 as a humble grocery store, today Harrods is the single biggest department store in the world and offers everything from food to fashion, furniture to sportswear plus 20 restaurants and specialist services including dog coat fitting and piano tuning. Though now under new owners, there is still the Egyptian hall and stairs as well as possibly the greatest food hall in the world. 4. 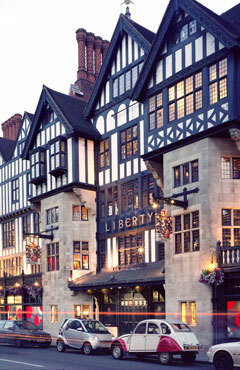 Liberty – From the outside, it looks like an even more traditional store than its 140-year history implies but appearances can be deceiving and if you step inside Liberty you’ll find a whole host of cutting-edge fashion. Designers include Vivienne Westwood, Chloé and Dries Van Noten and don’t miss out on their impressive beauty hall and haberdashery. If you appreciate the finer things in life, then you’ll appreciate Liberty. 5. Fenwick Established in 1891 as a hair accessories boutique, Fenwick is now home to five floors of luxury retail on one of London’s chicest streets. Choose from designer clothing, homewares, bags, shoes, fashion, jewellery and more. The cosmetic department is an oasis of exclusive products and Carluccio’s café is the ideal place to relax. 6. Harvey Nichols A must see for any fashionista who are particularly looking for high-end names, The store brings together an impressive range of designers from around the world and supplies an elite clientele with fine clothes, accessories, cosmetics, food and shoes. D&G, John Galliano, Space NK, Burberry and Jimmy Choo are just some of the brands you can find here. 7. Marks & Spencer – It’s where the locals have shopped for well over a century with its reputation for quality but affordable products. Whatever you need, M & S is the place to go from clothing to flowers, furniture and fabrics. There’s also Café Revive and the mouth-watering aisles of the food hall. 8. John Lewis – The most popular British department store for us Brits. The flagship London branch stocks nearly half a million products from buttons to beds and cushions to cufflinks. The store boasts seven floors of fashion, beauty, home and technology products, plus a new Brasserie and Bistro with a panoramic view of the West End. 9. House of Fraser – One of the best-known names on Oxford Street! House of Fraser is renowned for its designer brands and exclusive collections, it’s the place to go for a little bit of luxury, whatever your budget. Browse through top brands including Cath Kidson, DKNY and Ted Baker then relax in the Clarins Spa or try out the Cafe Zest restaurant. 10. Selfridges – Whether you’re simply a fan of the popular TV show or you want to indulge in some serious shopping, Selfridges has something for you. If it is bags, shoes, cosmetics, soft furnishings, books, a speciality food hall or cafés – you’ll find it in Selfridges. There is also low-cost designer clothing section and a Superbrands department with big names such as Balenciaga and Stella McCartney too! Adult Prices per person (child prices available upon request).